Kovada Lake National Park with the surrounding area of 6534 hectares is one of the Turkish National Parks since 1970. It was declared as a 1 level protected area in 1992. The lake, which is quite shallow, is about 6-7 m in depth, while the width is 9 km. Sediment in the water gives the lake its green colour and hinders the vision beneath 1,5 m.
Kovada Lake National Park lies east of Isparta, and south of Egirdir. The park can be accessed off the 23 km-long road which runs south off the Isparta – Egirdir – Konya highway. The area is popular for trekking, climbing and basic camping. South from Egirdir (Eğirdir) a quiet road follows a wide, flat-bottomed valley planted with apple orchards and carpeted with wildflowers in spring. Kovada Lake National Park is a rich working and recreation place for nature lovers. Many kinds of trees from red pine to juniper; from wild olive to European and Turkey oak constitute the basis of the natural flora. Herbs like wild rose, daphne, blackberry enrich this structure. The diversity of flora can be observed in wild life, however many animal species have been endangered due to hunting. Yet, you shouldnt be surprised to see martens, badgers, wild bears, foxes, squirrels or rabbits. 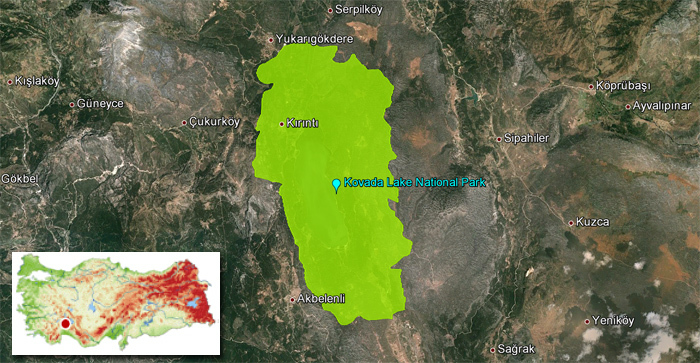 Kovada Lake is added like a little green pocket to the triangle created by Burdur-Egirdir- Beysehir Lakes. If you wander around this lake which is located at 30 km south of Egirdir, coots, wild ducks, and grey herons scared of your voice, will get off from their places under the trees and fly towards to opposite coast of the lake. Isparta is, to some extend, the whispers among the plane trees which surround Kovada Lake like a dark yellow necklace in autumn. thanks to the trees growing among the rocks, it presents beautiful views when looked from the hills around. While going to Kovada Lake from Egirdir town along the channell, apple and cherry trees, colourful poplars, reeds along the water welcome you. Sometimes you go through a mist which covers the road like a white veil. Kovada Lake is an important point for bird watchers as well. Its waters are valuable as it is a watering hole for migratory birds. Wild geese, rudy shelducks, herons, wild ducks, woodcocks come to the lake. If you happen to see bouncing birdson the rocks, know that they are partridges. As for the inhabitants in the water, they are carps, sudak (Lucioperca lucioperca) ,pool fish, egrez (vimba vimba), velvet fish, eels and fresh water lobsters. The surrounding area of the Kovada Lake in national park is 20.6 km and its height above the sea level is 900 m. There are walking courses around the lake for those who love hiking. Beginning from the small recreational facility of National Parks General Directorate of Turkey, the short road is a 350 m walking course. Another road beginning at the same point and reaching out to the watch tower is 2.800 m. long. Professional travelers can camp by the lake and go for longer walks. The erosion of limestone and folding of the earth’s crust by tectonic effects account for the formation of Kovada Lake. Karstic topography created by the erosion of limestone is quite apparent. Being a natural southward extension of Lake Egirdir, Kovada Lake acquired its present form when the narrow valley between the two lakes drained and turned into land. Today these two lakes are linked by a channel. Candir Canyon, is a further 35 kms drive from the Kovada Lake National Park and is a popular destination of tourists and locals alike. The crystal blue swimming holes of Candir are its most popular attraction. Here you can enjoy jumping from heights of 6-9 m. through refreshing showers of cascading water. However, before reaching these beautiful waterfall covered rocky cliffs and natural coves, you must first walk a short stretch of the infamous ‘Kings Road’. In ancient times Lydian rulers used to travel along it from Ephesus to Babylon. Egirdir is a town situated on the southern tip of Lake Egirdir, overlooking Mount Davraz. Lake Egirdir is the fourth largest lake in Turkey. The Lake is located between Beysehir (Beyşehir) Lake to the east and Burdur and Acigol (Acıgöl) Lakes to the west. Its width changes between 1.5 and 16 km.The lake is divided into two parts. The smaller part on the north is called Hoyran while the other part is called Egirdir Lake. These two parts come together in a narrow strait between Akdag (Akdağ) and Barla mountains. The mountains are located as if they are hugging the water in all directions. The lake looks like the letter “S” in sattelite photos. Shores are generally steep but Gelendost and Uluborlu plains and Hoyran shores are rather shallow, and end in reedbeds. Egirdir Lake is fed not only by rain and the melting snow. Many fresh water sources also feed the lake. A very beautiful excursion spot which appears just like an oasis and a shed -like restaurant where you can eat fish will welcome you.